Mama Mia's Babies - 6 weeks old! Mama Mia's babies are now 6 weeks old. Mia has chilled a bit. She is a very protective mom but she is realizing that humans don't want to hurt her babies. The Mama took Mia and her babies to her office this week. Mia was stressed out but it was very good socialization for the kittens. The Mama always tries to get a photo of all the kittens. This is the best one out of the gazillion she took. So you can see it isn't easy to get them lined up and looking at the camera. The kittens are about a pound each. They are a little small but happy and healthy! The kittens are participating in The Cat on My Head's Sunday Selfie Blog Hop. Please hop on over to see the other entries. 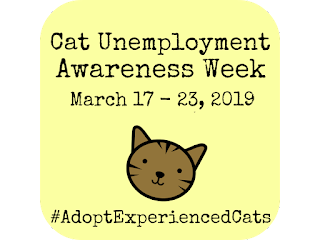 We founded Cat Unemployment Awareness Week in 2015 to bring light to the millions of homeless and unemployed cats in animal shelters. The cat unemployment rate is still extremely high. Approximately 3.2 million cats enter US animal shelters every year. 860,000 of those cats are euthanized. Only 1.6 million cats are offered employment through adoption. Experienced cats that are in the job market for best friend positions are concerned about the upcoming kitten season when the job market will be flooded with recent kitten graduates. Experienced cats tend to have a harder time finding jobs compared to their younger kitten counterparts. Potential employers have a habit of hiring based on age and playfulness rather than the knowledge an experienced cat brings. If you are looking to hire a best friend, there are several reasons why you should consider employing a more experienced cat. Recent kitten graduates require more training. Kittens do not always understand employers’ expectations in regards to litter box usage or scratching. OCSA (Occupational Cat Safety Administration) has greater safety requirements for kitten employees. All work places must be “kitten proofed”. Hiring an experienced cat, you know what you are getting. Their work habits have already been established. Experienced cats require less supervision. They can be left alone and even be in charge of the workplace when you are not there. Experienced cats also know how to handle different types of people. Cats can be more patient with younger children and have the knowledge to stay out from under the feet of the elderly. 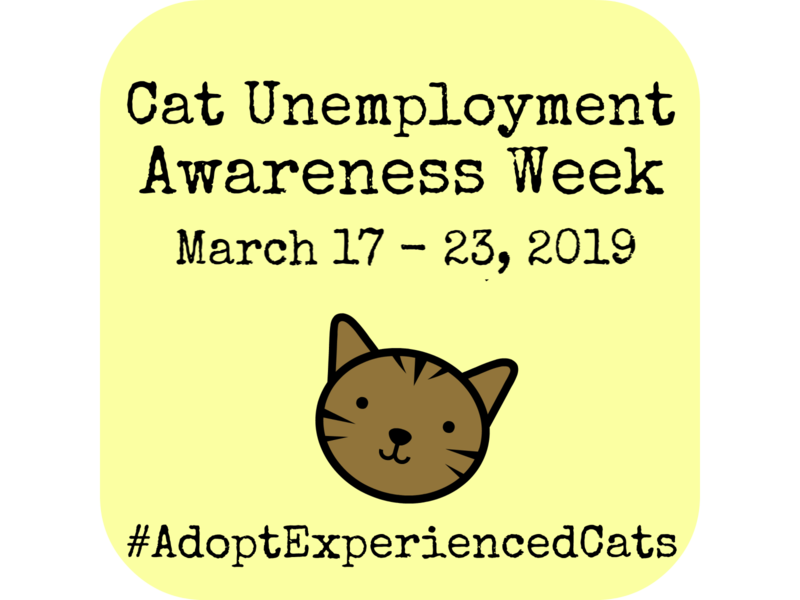 If an experienced cat sounds like the best applicant for the job as your best friend, your local shelter or rescue will have many experienced cats that have been unemployed for quite a while and are very eager to get back into the workplace. If adoption isn't an option for you right now, every day this week consider sharing on social media a cat that is available for adoption at a shelter near you. Someone in your social circle may just fall in love with a cat you share. Together we can help end cat unemployment. OMC! We didn't realize how bad we have been about blogging! December 24th was the last time we blogged! Yikes! We will try to be better. We do post more often on Instagram and Facebook so make sure you follow us there. For those of you that follow us on social media, you know that we got so new students back in February. We received a mama cat and her six 4-day old babies. Since our Mama kept singing the song Mama Mia to the mama cat, we decided to name her Mia. Mia must not have like our Mama's singing as she refused to let her close to the babies. Mia is a great mom but was very protective! The kittens are now 4-weeks old. Mia has decided that our Mama is not so bad; especially if she has meat tube treat! Mia lets the Mama hold and pet the kittens. In the last couple days, Mia will rub up against the Mama and even let her pet her. Not too much though! Enough words! I'm sure you want to see pictures of our new students. Since the mom cat is Mama Mia, we decided to name her babies after characters in the movies. You may have noticed Sam is the only boy, he is smaller than his sisters, and he has a bendy front leg. He doesn't let any of that get him down! He can't straighten that front left leg but he is able to scoot around and can keep up with his sisters. Since it is Sunday and the babies did such a great job with their selfies, we are joining The Cat on My Head blog for their Sunday Selfie Blog Hop. Please hop on over to see the other entries! Gus: Cats with Blogs is a close-knit community. One of the highlights of this group is our annual Secret Paws gift exchange. You humans might call it a Secret Santa gift exchange. We have as much fun choosing the gifts to send as we do receiving the gifts. Our foster student, Fargo helped wrap the gifts we sent to our Secret Paw. We hope they like it! We gave everything the sniff test and it met our approval...even Pearl's! She's rather particular. Unfortunately, Fargo had to go back to the shelter before we opened the Secret Paws gift we received. Don't worry! We sent Fargo back to the shelter with his own Christmas gift. We even gave him extras to share with the other kitties at the shelter's veterinary center. Well, Jaq, let's open our gift! Pearl! Are you coming? It's time to open our Secret Paws gift! Gus: Look! It is from Butterfly and Peekaboo at Musings, Meows, and Memories. We haven't met Butterfly and Peekaboo yet but that is what great about Secret Paws. You get to make new friends! Gus: Smell this, Jaq! CATNIP!!! This is awesome. Jaq: This note says the blankie was made by Jana at Colorado Catnip Toys. Pearl: It's pink so that means it's MINE! Gus: No way! We have to share! Don't forget it's the season of giving and sharing! Let's look at what else is in the box. Gus: Let me open this next package. Pearl: That's such pretty wrapping paper! Jaq: Look at all those sparkle balls! Gus: Try not to bat them all under the couch! Jaq: Well, maybe you shouldn't give them all away to our students! Pearl: Boys! Boys! There is plenty to share! Didn't you just say it was the season of giving and sharing? Jaq: Dudes! Look what else is in the box. Delectable Squeeze Ups. I think I'm in heaven! Gus: I think we need to take a snack break! Gus: Get your own, Pearl! Pearl: Sharing, Gus! Tis the season of sharing! Gus: What a great snack break! But we still have more gifts to open. Jaq: Wow! A whole box of crinkle balls! Pearl: Ooooh! Pretty There's even some jewelry and a candle for the Mama! Gus: Thank you Butterfly and Peekaboo! We LOVED everything! Pearl and Jaq: Thank you! The Big 3!!! It's the "This Is Us" Kitten Edition! Will Kevin continue to worry about what others think of him? Will he make it as a serious film star? Will he conquer his lifelong battle with addiction? Will Kate continue to struggle with her self-esteem? Will the relationship with her mother improve? Will she be able to have the baby she's always dreamed about and continue her father's legacy? Will Randall have issues due to the fact he is adopted? Will he run for public office? Will he have another nervous breakdown? Stay tuned to As the World Purrs to answer these questions and more! The students are progressing very well! Franklin is well over 2 lbs. Aretha is almost there. We are postponing their surgeries a bit so that they can have more socialization lessons. Franklin is the most outgoing. He will seek out attention but only for a few minutes. Aretha will accept affection but does not seek it out. The Mama plans to take them to work one day this week. She hopes it will get them out of their comfort zone without scaring them completely. In between lessons, Franklin and Aretha took some selfies. I think they have the hang of it! 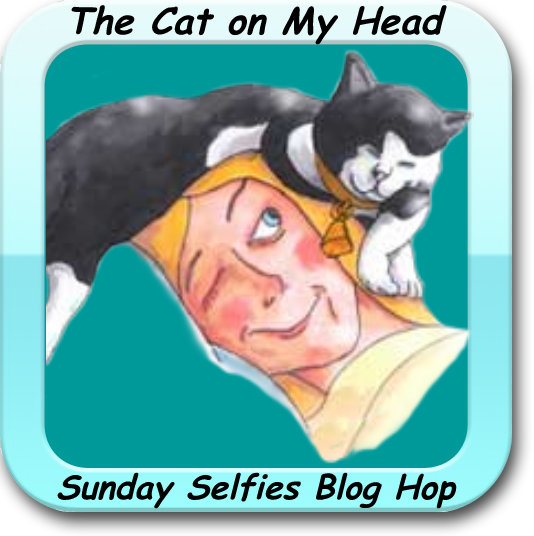 We are pawticipating in The Cat on My Head's Sunday Selfie Blog Hop. Please hop on over to see the other entries. Purrty please! With a voice that inspires, we present to you Aretha! Able to stir your soul with a single meow, Franklin! 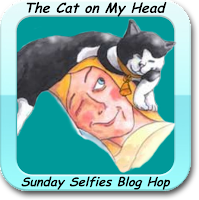 We are participating in The Cat on My Head's Sunday Selfie Blog Hop. Please hop on over to see the other entries.